Kids First Health Care is committed to making data-driven improvements at our eight pediatric clinics. 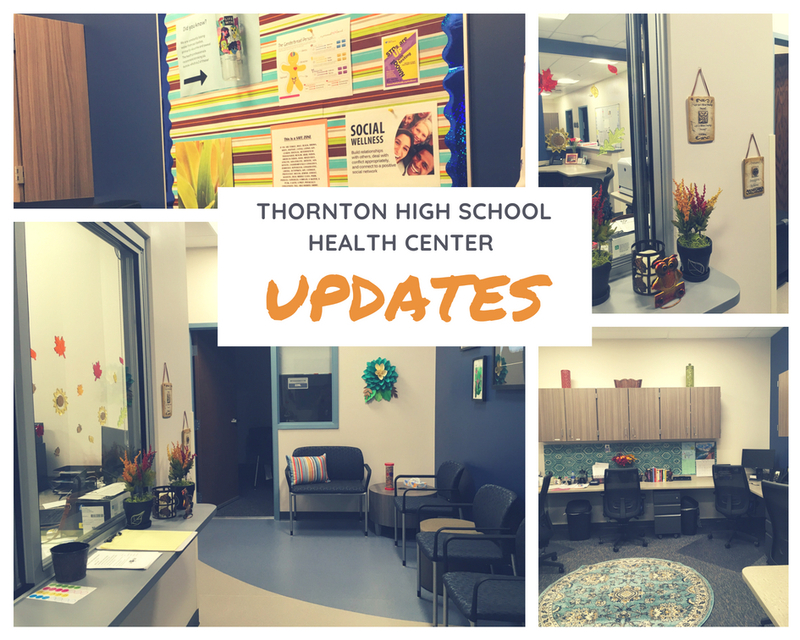 Last spring, we conducted surveys and focus groups to evaluate and improve the new school-based health center (SBHC) at Thornton High School. Evaluating the health center during its first year of operations provided a great opportunity to quickly address any concerns and make improvements to maximize our impact. 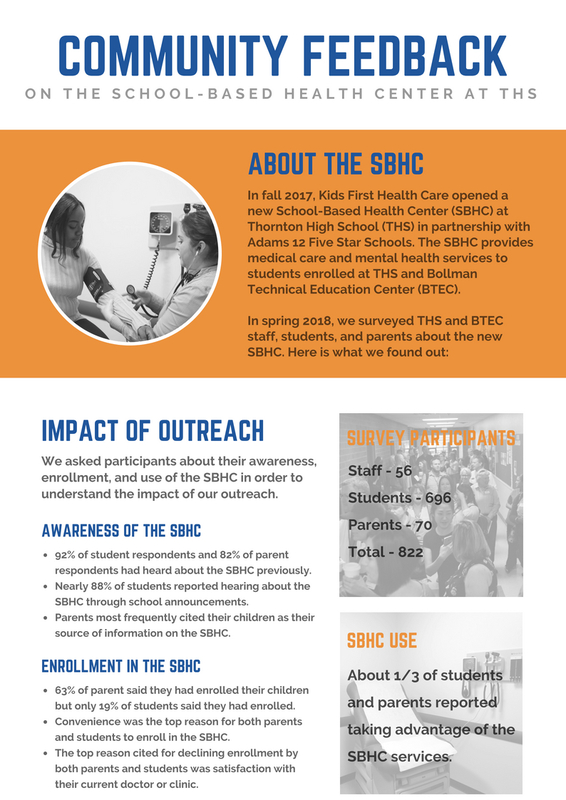 We surveyed 696 students, 70 staff members, and 56 parents at Thornton High School and Bollman Technical Education Center–the two schools that the SBHC serves. We also conducted two focus groups with students at Thornton High. Through these tools, we found out about participants’ perceptions and use of the SBHC. Most participants were aware of the new SBHC at Thornton High. The top reason that parents and students decided to enroll in the SBHC was convenience while the top reason that they declined to enroll was satisfaction with their current doctor or clinic. In response to these findings, we started emphasizing the convenience of on-campus health care and sent letters to all eligible families explaining how the SBHC can benefit students who already have access to health care. 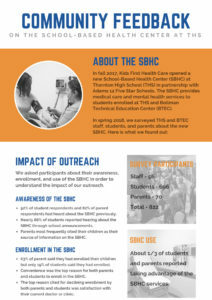 About one-third of parent and student participants reported taking advantage of the SBHC services. Most patients reported satisfaction with the SBHC–93% of parents whose children had used the SBHC said they are satisfied or very satisfied with the care their children received at the SBHC while 76% of students who had used the SBHC described their experience as good or very good. In particular, students emphasized their appreciation for the caring and respectful staff. 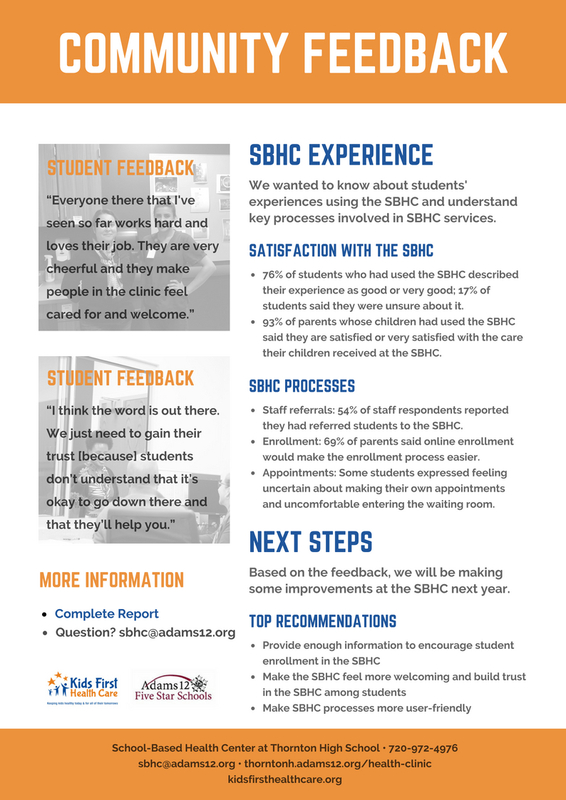 Through the survey, we learned that school staff members needed more information on the SBHC services in order to refer students to the health center. In response, we distributed a health center information sheet to all school staff members and increased the frequency of our all-staff emails. We also discovered that many students felt uncomfortable walking into the health center’s quiet, sterile waiting room and were uncertain about how to make their own appointment for the first time. In order to make the SBHC more welcoming and user-friendly, we made several updates to the SBHC lobby–adding warm and welcoming decorations, playing music in the waiting room, posting guidelines on making appointments, decorating the entryway, and more. It’s great to see tangible improvements at the Thornton High SBHC in response to community feedback! We will continue seeking community feedback and fine-tuning the new SBHC this school year. For more information, please see the complete THS Evaluation Report or the brief Evaluation Summary. More data-related updates will be coming soon!